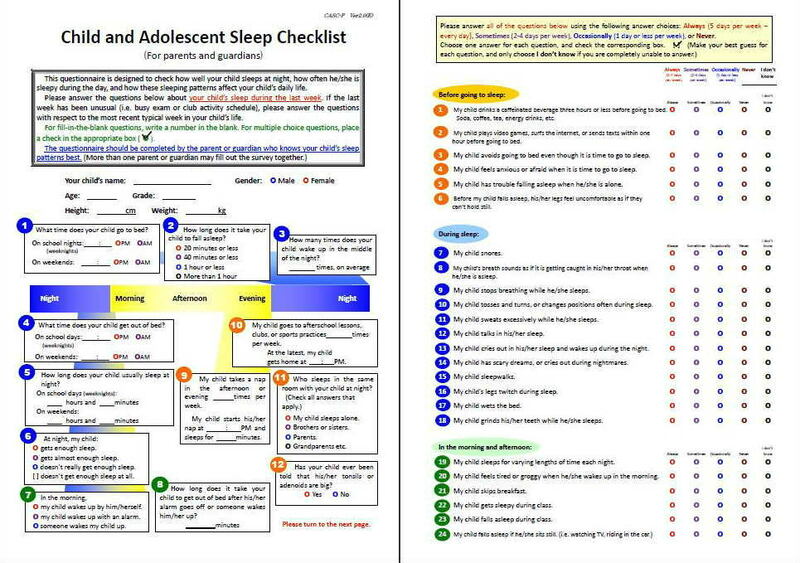 Child and Adolescent Sleep Checklist (CASC) is designed to identify sleep habits and to make a screening of sleep problems among preschoolers, elementary school children, and high school students. CASC has three versions. Parental / caregiver version is for all age groups (ages 3-18) to be filled out by the caregivers. Student version (for elementary school; ages 6-12) is to be filled out by students themselves under the instruction of the examiners; i.e. teachers, caregivers, or medical professionals). Student version (for high school students; ages 12-18) is to be filled out by the students without instruction. In order to enable both cross sectional and longitudinal studies, all these versions use same set of questions. CASC is open for clinical use and for research use. PDF files of the questionnaire can be downloaded through the link at "Download CASC" page. For industrial use or commercial use, please contact us. To maintain consistency of the questionnaire and the scoring results among the studies, please use the questionnaire without modification. Currently available language options are English (international version) and Japanese. Translation to other languages is welcomed. In order to avoid having multiple translations for a language, please let us know of the new language version when you have created. We are pleased to upload the new language version on the CASC website. As CASC is a copyrighted material by the group of investigators at Ehime University Graduate School of Medicine, distributing the CASC materials outside the CASC website is not allowed. Oka Y, Horiuchi F, Tanigawa T, et al. Development of a new sleep screening questionnaire : Child and Adolescent Sleep Checklist (CASC). Japanese Journal of Sleep Medicine 3(2) 404-408, 2009. If you have any questions and comments, please feel free to contact us.